When it comes to a makeup, false eyelashes can be a great choice, especially for parties or special events! To get the perfect look, it is necessary to take some care while applying them. Don’t put too much glue and always follow the steps when applying the false eyelashes. Are you curious to know more about the common mistakes that you should avoid? Check them out! If the eyelashes are intended to look natural in the eyes, it is important not to leave any space between the base and the lash line. Often, when gluing the eyelashes, a small leaked line remains, which can make everything look artificial. Try to apply the falsies close to the natural eyelashes and do not forget to make a black outline to correct any imperfections. If you are a beginner, you can have some insecurity when using false eyelashes and end up thinking that the larger the amount of glue, the safer the eyelashes will be. Big NO! In that case, the less is more, and if you exaggerate with glue, it will be more challenging to hit the position of the lashes, and they will glide until they dry. Another problem could be that the glue can be super visible. To hide the extra glue, it is worth using the trick of applying the eyeliner. For eyelashes to look clean, the position of the eyes and your head during application is also important. In front of the mirror, you look straight and close your eye to apply the accessory, right? In fact, this habit can leave the eyelashes bent and positioned down. There is a more practical way! Just lift your chin slightly and glue the fake lashes with your eye open, looking down. It may seem intuitive to glue the false eyelashes to the original ones, but actually, they should be applied to the skin. However, the closer to the natural, the better – just be careful and don’t let them be in contact with your natural lashes because it will be difficult to remove them. When applying, it is worth using a straight-edge forceps. It will help you to position them in the center of the eye and touch the corners. Glue from top to bottom. Apply before or after eye makeup? That is the question! The best is to apply the false eyelashes later since if they are glued before, the volume of the lashes will disrupt the application of the shadow, pencil, illuminator … and the residues of these products can also fall on the false eyelashes and let the makeup with a weird look. Therefore, prepare a flawless skin and put your time on the makeup before applying false eyelashes! One of the biggest fears of those who wear fake eyelashes is that the accessory has an artificial look that is very prominent in makeup. If the eyelashes are longer than the eye line, you need to cut the tip following the natural lash line. It is advisable to do this with little scissors and cut the pieces always from the outer corner! Another tip is to divide the eyelash clusters into three parts so that they are easier to mold to the eye. 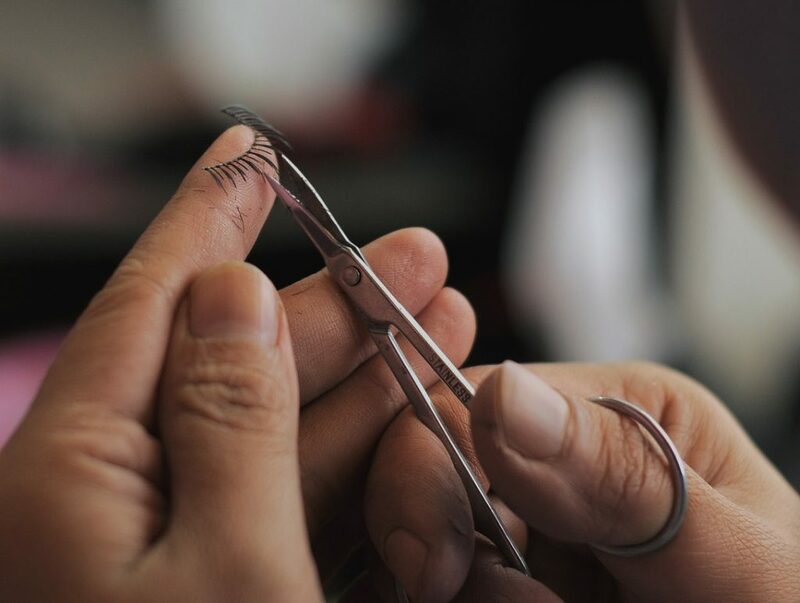 Anyone who is already used to apply false eyelashes knows that soon after gluing the ideal is to use the other side of the forceps and carefully pin the ends. It is important to pay special attention to these areas for good finished results! It is common that on days when we have a tight schedule is a rush to do the makeup, but even then, pay special attention to false eyelashes. So, wait about 30 seconds for the glue to thicken before applying to the natural lash line. When you don’t wait for this time you run the risk that the accessory will not stick correctly. A good finish is essential in any makeup, and if you use the false eyelashes for a natural result it is important to apply the eyelash mascara to join the natural with the false eyelashes thus leave the look with the light and flawless finish!